It’s a $6 billion city-within-a-city proposed for a densely populated area on the city’s North Side. 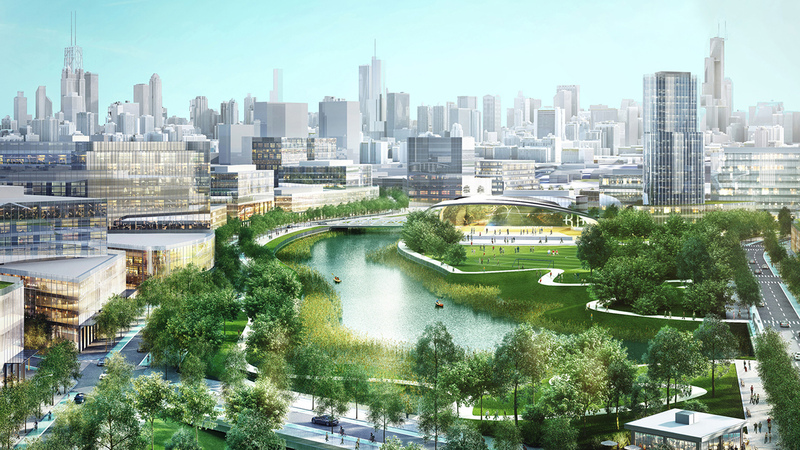 On Thursday night, the development company Sterling Bay is set to unveil its latest plans for Lincoln Yards, a massive project that is slated to tap up to $800 million in public dollars. So why is the project getting so much pushback, including from a group of music venues that have banded together to oppose the deal? Sterling Bay has scaled back a plan that had earlier featured multiple high-rise buildings as tall as 70 stories on a 70-acre site that was formerly home to Finkl Steel. The area is wedged between the residential Bucktown and Lincoln Park neighborhoods, bordered by North and Webster Avenues and the Kennedy Expressway and Chicago River. The most updated proposal calls for a new minor league soccer stadium, multiple music venues, a new Metra Station, an expansion of the 606 trail, residential and commercial high-rises and more green space – although not the public park some are looking for. Mayor Rahm Emanuel has proposed an $800 million tax increment financing (TIF) district to help fund the project. But the area’s alderman, Brian Hopkins (2nd Ward), says he hasn’t seen the latest proposal from Sterling Bay and that this very profitable private company will not walk away with any of the public’s money if the project is approved. Beyond the TIF money, residents have voiced a myriad of concerns about the project, especially what it could mean to traffic. Up to 50,000 people could be brought into an already densely populated area that experiences road congestion. Also, a group of residents is calling for a 24-acre nature preserve and park along the Chicago River. They say the community badly needs it, and the city shouldn’t waste the rare opportunity to put public parkland along the Chicago River. And another wrinkle: a group of music venues has forged an alliance to push back on the project as well, including Metro, the Empty Bottle and The Hideout. This is partially because the project endangers The Hideout, a beloved music club on the site. Hopkins says he has proposed giving the club landmark status so the developers have to leave it untouched. The community meeting takes place at 6 p.m. Thursday at the Park Community Church, 1001 N. Crosby St.